The rumors are true! 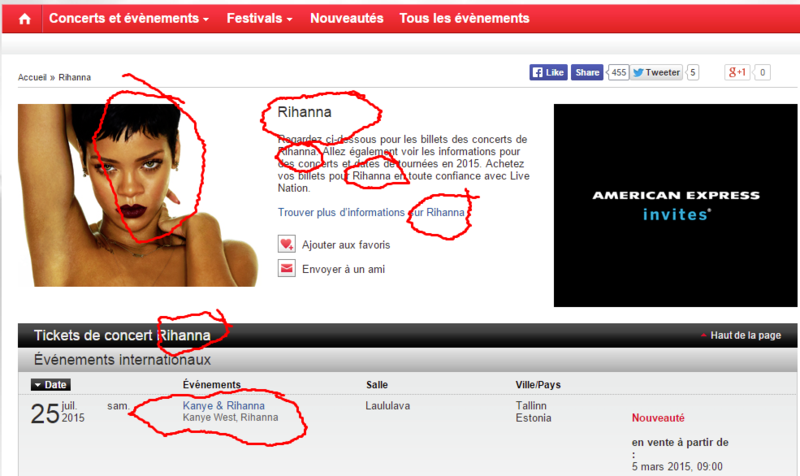 Well, at least according to a leak on the LiveNation website, which is showing that the first date on the Kanye + Rihanna summer tour will be on July 25 in…*drumroll please*… Estonia! Sooo, yeah. Let’s cross our fingers for some American dates to be announced soon. For now, check out the video of the two musicians performing with Sir Paul at the Grammys earlier this month, shown below. When Rihanna sent out a mysterious tweet last month in which she was auctioning off a meet-and-greet package for a yet-to-be-announced Kanye tour, nobody really flinched. (Probably because nobody can stand Kanye anymore, but that’s neither here nor there.) But earlier this week, when COMPLEX magazine was sent an anonymous photo that indicates Ri Ri and Kanye would be co-headlining a 2015 summer tour? Well, that’s news. It wouldn’t be completely shocking for the two to hit the road together. Their collaboration with Sir Paul (you know, that dude from that band) for the song “FourFiveSecondsTogether” just dropped, plus Rihanna opened for Kanye during his 2008 tour. Obviously Kanye isn’t known for his ability to share the spotlight, but he did make a ton of money co-headlining with Jay Z for the 2012 “Watch the Throne” tour, so anything is possible. I think the real question folks should be asking here is if Paul McCartney will be joining them. Now that’s a show I’d pay to see.